Among the common garden insects of today, bees, wasps and hornets steal the show during the spring and summer months. They belong to the Hymenoptera insect classification. An interesting love-hate relationship exists among the humans for this particular insect group. All of them are both useful as well as harmful insects which make it necessary for all to know and understand them better. They are practically the colonial cousins where the anatomy of each other and their feeding habits differ to some extent. Apart from these, all four follow the same hierarchy levels, have a short life span, build nests and sting when provoked or threatened. Bees, wasps and hornets difference can be highlighted through its anatomy and lifestyle. 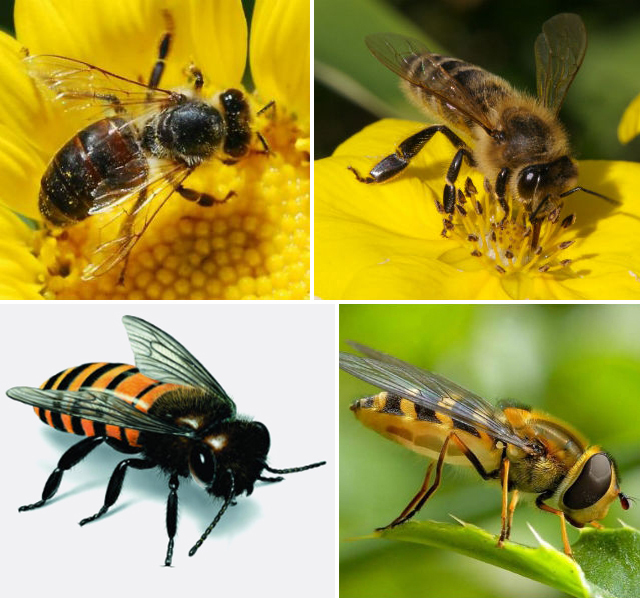 There are various types of bees, wasps and hornets and the general view of each of them is given below. Bees are the fuzzy looking bugs that are hairy on the outside and easy to identify. The branched hair helps to regulate their body temperature and carry pollen. Like other colonial insects, the body has three sections namely the head, abdomen and thorax. It has two sensory antennae and a barbed sting that sticks into the mammals that it stings pulling out a part of its abdomen with it and hence more often than not killing it if it stings. The waist of bees is not significantly clear and it is as wide and bulgy as the rest of the body. Bees are found globally and can be classified into 20,000 different species. They belong to the super family of Apoidea. The largest of them is the Megachile Pluto that is 3.9 cm long and the smallest of them are the Perdita minima that are about 2 mm in length. Bees can be of any color, the most common are the brown and black ones with yellow, red and blue stripes. Wasps belong to the Vespidae genus and is often a generalized term that is used to define many predatory colonial insects that include hornets and yellow jackets. Unlike the bees only very few wasps are pollinators whilst the majority of them are either parasitic or predators that feast on other pest insects for food. The appearance of the wasps may be similar to those of the bees and hence it needs some accurate inspection to tell the difference. Wasps do not have the body hair like bees but have the same body segments of head, abdomen and thorax. They have a pair of wings and a clearly pinched and significant waist. The color pattern is mostly black, yellow or brownish red. The wasps have two long rear legs which can be significantly highlighted in flight. They dangle and hand straight down when these creatures fly. The wings are pulled in when the insect lands. They have do not have a barbed sting and hence are able to sting any number of times at its prey, predator or any living thing that it considers as threat. Hornets belong to the Vespa genus and are the larger, aggressive members of the Vespidae family. 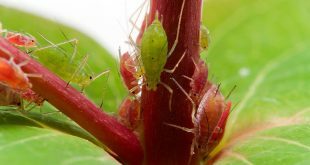 The bigger species grow up to 5.5 cm and are predators of insects and caterpillars that are considered as agricultural pests by humans. They have a soft stinger and poisonous venom that can turn fatal for the victims in some cases. Being part of the wasp family, hornets have a thin waist. Hornets can be distinguished from the wasps with their more rounded gasters – a section of the abdomen that is very close to the thorax. Most hornets are black and white in color with the exception of the yellow hornet that has a distinct yellow tinge. The vertex of the hornets is wider than that of the body width which helps in identifying it from the wasps. The stinger does not have a barb and hence are capable of inflicting multiple stings on its enemies and prey. Japanese bees have evolved and developed a new defense against the Asian Giant Hornet by offering bait while others surround it forming a patch and sting it to death. Sting insects have always been feared by humans due to the impact of the venom when injected into them. It is important to remember though that these insects feel fear and sting when provoked or feel threatened. Hornets fiercely protect their nests and can sting repeatedly if they feel that their nest is threatened. They are not comfortable with vibration and noise and can attack on impulse. The sting of a honey bee carries more toxins than those of the wasp or hornet. The stinger kills the bee but if the sting is not removed on time the venom sac can empty itself into the wound which can become dangerous for the victim. 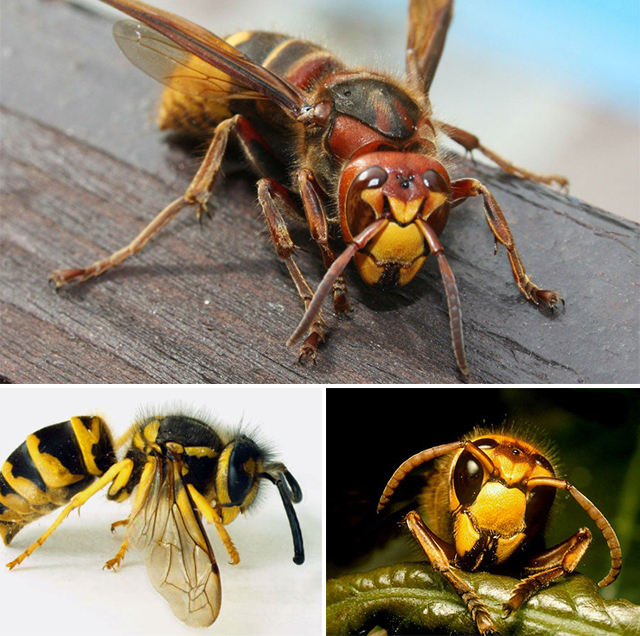 Wasps and hornets are capable of stinging its victims multiple times unlike the bees.